Address: Carretera de la General s/n, Ordino, Andorra. 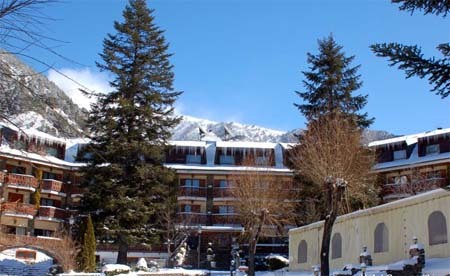 Hotel Coma is situated in the Andorran mountain village of Ordino. It offers an outdoor pool and tennis courts, and organises outdoor activities such as hiking, canyoning and skiing. All spacious rooms at the Coma Hotel are south-facing and most have a private balcony with garden or mountain views. Each private bathroom has a hydromassage bath and a HD TV with satellite channels. The hotel has its own restaurant which specialises in traditional Andorran and Mediterranean recipes using fresh local products and homemade sweets. There is also a café-bar which serves snacks and drinks. The hotel offers discounts at Ordino Sports Centre, located 500 metres away, where there is an Olympic-size swimming pool, fitness centre and Turkish baths. The ski slopes of Ordino-Arcalis are around 20 minutes' drive away while the lifts to the resort of Pal are 4 km away. There is also a bus every 15 minutes to Andorra la Vella.